Have you ever visited the Sharing Time Visual Aids Gallery? I used these pictures to make child-sized booklets. For captions, I wrote very simple sentences. 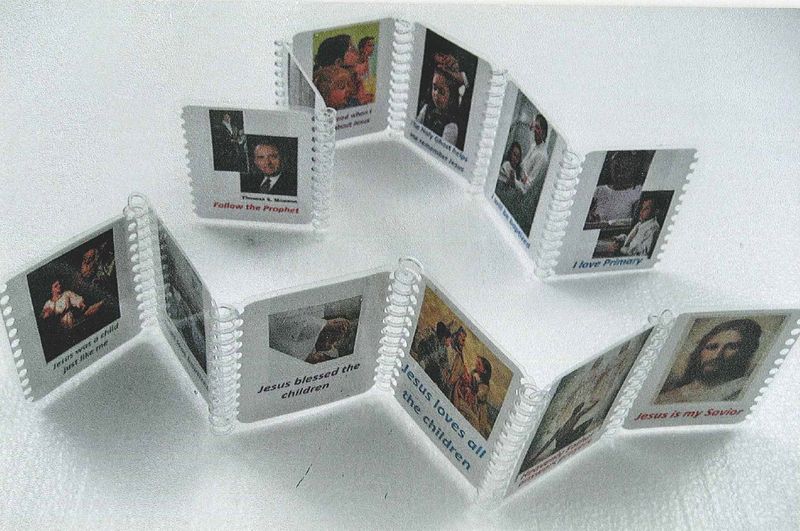 One side of the booklet has a picture of the Savior, and the opposite side shows a picture of a modern child or family. Coils between the pages make it extra interesting for little hands to fold and unfold. Making the CDs was a snap—I just went to this “Songs from Outlines for Sharing Time” page and downloaded the free audio files that I needed. Then I burned them to discs using my computer’s music program. This worked for me because our Primary is a small one. If you have too many children to give each one a CD, perhaps you could make one per family. And if that's still too daunting—or technology isn’t your strong suit—just spread the word about this page and let parents do the downloading! By encouraging children to interact with Primary songs outside of church, we are helping them develop a musical habit that can comfort, inspire, and fortify them for years to come. Do your kids like looking at the drawings featured in the Friend’s Show and Tell pages each month? Those pages in the magazine are never big enough to include all of the wonderful artwork we receive, so we’ve decided to create an online album! This album can be found at childart.lds.org, and will feature ten new drawings each Friday. The art will be posted for a month. Make sure to share this great album with your children, and click through yourself—these beautiful illustrations are sure to brighten your day. Following the Savior’s resurrection, He appeared to the people of Nephi on the American continent. He lovingly invited all that were gathered together to come forward so they could feel the prints of the nails in His hands and feet. In 3 Nephi 11:15, we read, “and this they did do, going forth one by one until they had all gone forth, and did see with their eyes and did feel with their hands, and did know of a surety and did bear record, that it was he, of whom it was written by the prophets, that should come.” The Savior ministered through many individual acts of love. Teaching, No Greater Call states, “Consider the last lesson you taught. As you prepared and presented the lesson, what did you think about? … How much did you really know about the individuals you were teaching? … How might knowing at least something about each of them have made a difference in your lesson?” (Teaching, No Greater Call, page 33). Brother Matthews, who taught our four-year-old son in Primary, understood the value of reaching the one. He always said hello to our son in the hallways at church and reached out on his birthday and at Christmas. Wherever we saw Brother Matthews, he always made a special point to greet our son by name or ask about him. He demonstrated these same acts of kindness to each member of his class. Brother Matthews truly taught and loved the children one by one, and they in turn loved him. How can thinking about each child make a difference in your preparation to teach? How can you reach out like the Savior, one by one?